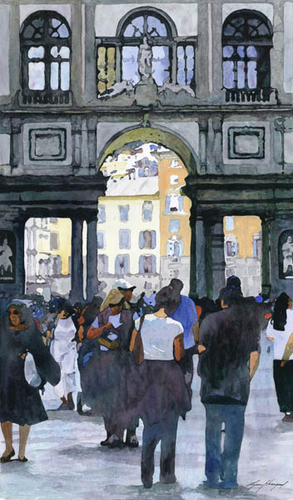 Piazza deli Uffizi Watercolor of famous piazza in Florence, Italy. A vertical painting with cool colors in foreground with a backdrop of warm peach and yellow. This richly colored, high contrast painting will give you feeling that you are following the tourists walking toward the River Arno when, to the right, when you reach the river, The Ponte Vecchio Bridge in all it's old world charm and splendor. The size you see here is image size. The price includes off-white cotton rag mat, cotton rag foam core backing, ready to insert in the frame of your choice. The framing adds approximately 8" to the height and the width.